Considered to be a Parsi version of ‘aapru’ England’s big Sunday fry-up, Akoori Pav is a popular breakfast dish at many households and especially when Parsis go on picnics. In NZ (where I come from), many Parsi families happily used to have Akoori picnics on the beach while the kiwis barbecued their sausages alongside, eyes agog! For something so popular, akoori is easy to make and can be customised to suit any palette – I like mine best with some melted cheese on top. Well, everything tastes much better with melted cheese on top so why not? While I had already decided to make some Akoori this weekend for brunch, I had a special last-minute treat. 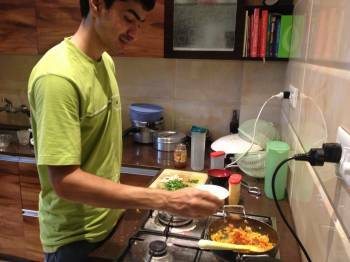 Abhishek Singh, Co-Founder of Imly – an online store for home chefs – dropped by for a chat for an article I have been working on. 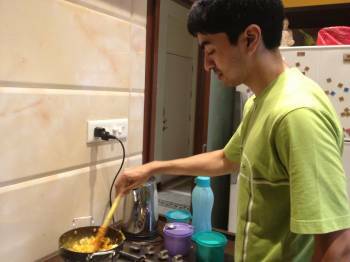 For someone who runs an online food store, Abhishek confessed he only knew how to make an omelette and toast so I took it upon myself to not only share my recipe for Akoori, Sausage and Brun Pav with him but also make him cook it step by step. P.S. 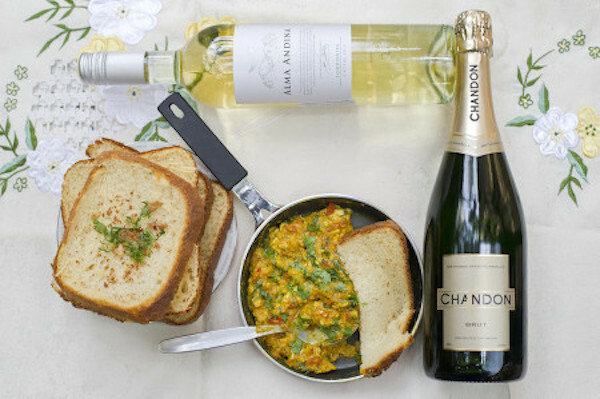 The picture above was taken on another occasion when I was lucky enough to have my food photographed by the very talented Aneesh Bhasin of Indian WineList – if you are curious to know what wine would go with an Akoori read this. For ingredients, refer to the bottom of the post. 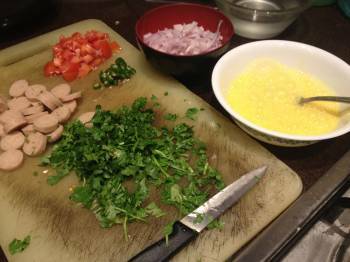 Before you start anything, wash all the vege’s and finely chop the tomatoes, onions, chillies, sausages, coriander and mint. Also break the eggs and give them a good whisk. 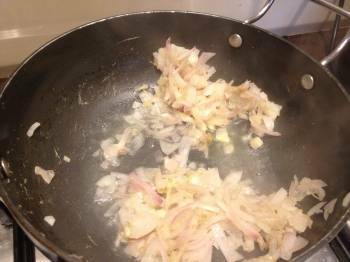 Once the onions are soft, add in the tomatoes while stirring continuously. Also add in all the masalas. In a slow stream, pour in the egg batter while stirring non-stop. 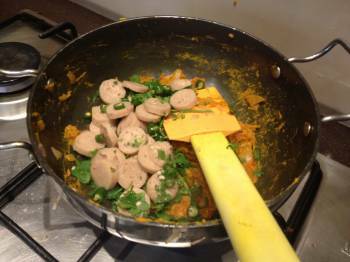 Add the sausages, half the coriander, salt and lemon juice. Let the eggs cook for a couple of minutes and ensure the mixture isn’t too runny. Serve hot with some Brun Pav from your local bakery or bake some of your own bread. 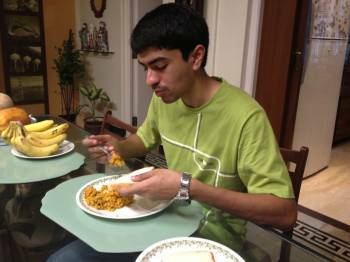 Needless to say it was a steep learning curve for Abhishek and I am not sure if he is going to return to my kitchen anytime soon given the surprise cooking lesson. He did mention that the Akoori was yummy though – that’s all that matters really in the end. And, if you live in Mumbai and haven’t checked out Imly.in yet – I suggest you do. It is a treat for fellow foodies and home chefs alike! I like the new layout. The recipe looks scrumptious as usual.. Thanks BB!! Thanks Ayesha for your comments as always. Do try it out and let me know how it comes out. Good innovation with the akoori. For the vegetarians like me, you can use cottage cheese instead of egg. 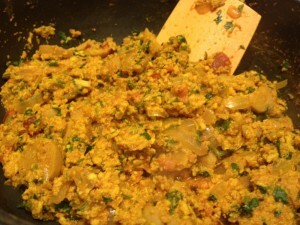 Thanks a mill for the lovely akuri recipe, it turned out to be just awesome !! My full family enjoyed it a lot. Take care n once again thanks. Hi Farhad – thank you so much for stopping by and I am so happy to note that the Akuri turned out well for you. Yes, will definitely post a recipe of the Parsi poro soon as well! Here’s hoping you cook many more things from the blog soon.